A week today and I will be turning 22, I feel like last week I just turned 18, so to think my 22nd birthday is so close is honestly crazy to me. I've reached that age where presents are few and far between when it comes to birthdays and instead most people hand you a card that contains money inside an envelope. When I get this money I always have a habit of either not spending it at all or blowing it on food, I don't really know why, but I am constantly finding myself buying way too much food for one small person. This time around I have scoured the internet looking for things that I want to buy with this money this year, presents from me to me in a sense and since most of the items I found myself heart eyed over were clothes, I decided why not share these gorgeous finds right here on my blog? I have been looking to update my wardrobe for a while now but thought it best to wait it out for some warmer weather before I get my spring wardrobe back out and ready for the season ahead. 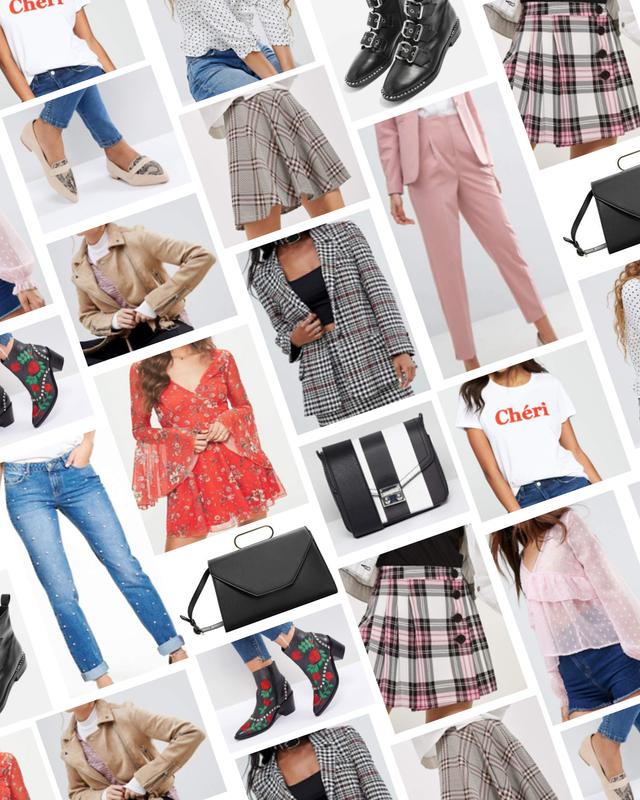 This wishlist is a look into some of the spring trends and key pieces I cannot wait to get my hands on and add to my ever expanding wardrobe. Some of these pieces are a little adventurous for me considering my very business casual personal style, but I just couldn't help myself but lust over these pieces and hopefully, I can pick them up and pull myself away from my comfort zone by trying something new and unusual. I love a good checked or tartan skirt, which is exactly why I have two on this list; number 1 and number 5. Number 1 is more of a proper tartan and for that reason I adore it, it puts a girly spin on something that is very masculine and of course being Scottish, I do love tartan myself. I love the buttons, it reminds me a lot of the denim skirts everyone was wearing last summer but the buttons are to one side giving it a little bit of a twist. Number 5 is still a tartan-esque print but it looks a little less kilt and a little more Clueless which if you know me, you know I am a huge fan of. I definitely think this skirt would be perfect for the warmer weather, maybe even paired with some shoes like number 9. 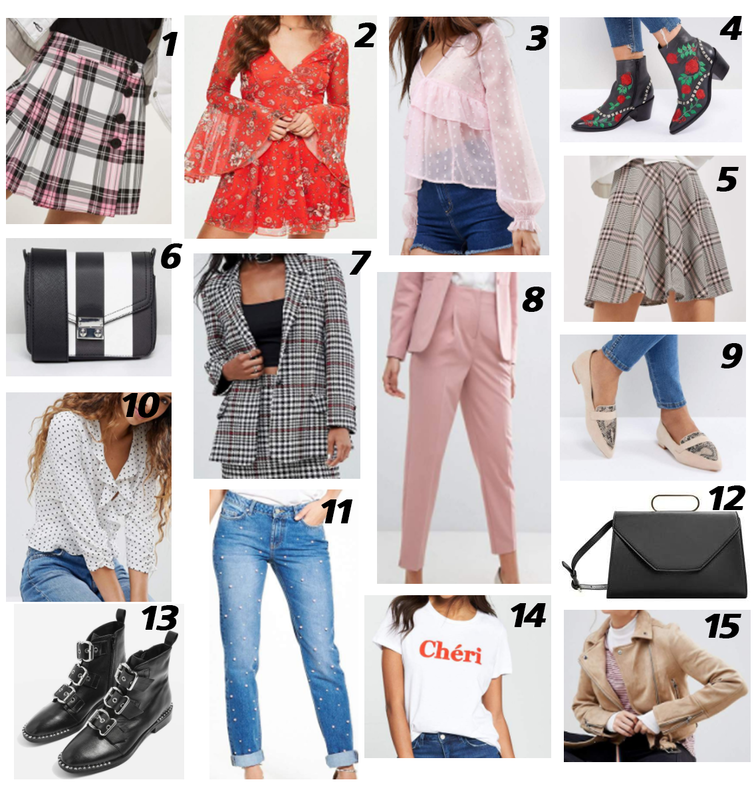 Number 7 is a blazer I have been after for a while now, it is the perfect checkered style to give you that Cher Horowitz chic without going into the bright yellow zone. I think it would be gorgeous paired with a nice blouse or slogan tee with a pair of jeans for a more relaxed and casual look. I am a sucker for some light, pastel pinks, but weirdly enough I do not wear enough of the shade, I am always a little worried I will look like cotton candy, so the best place to start slowly introducing the shade to my wardrobe is through shoes. I absolutely adore the masculine style of number 9, but by having them in such a pretty pink shade it gives them a feminine twist and I am a sucker for that, plus pointy-toed shoes are my favourite. Number 8 I fell in love with while scrolling through ASOS, they are the most gorgeous pink cigarette trousers, again, a little masculine but with the pink shade, they are perfect for any girly girl. I think these would look amazing paired with a little crop top and some shoes, maybe even a leather jacket to add some extra casual to the look. I am crazy about sheer look blouses as you probably already know if you follow me on Instagram, so number 3 should be no surprise. It is a gorgeous puffy sleeved, pink, sheer blouse that would look amazing with a pair of jeans for a casual look or a skirt for a more night time look. Now, red was a massive trend last spring and by the looks of things, I don't think the shade is going to be disappearing this spring either. When I saw number 2 I honestly said "oh my god" out loud because that is how much I adore the dress. It is the perfect spring/summer dress whether you're off on holiday, having food with friends or going to an outdoor party, this dress will make you look amazing. Number 14 is a much more casual approach to the colour and if you know me you know I love a slogan tee, especially when it's French so this tee will, of course, be in my wardrobe come next week. Now, black is a colour I can't help but wear and buy all the time, I try and I try to add more colour to my wardrobe but for every colourful piece I buy, I buy another 5 black items. I just can't help it, it is classic, it goes with everything and it is easy to style. Number 4 is a little mix of two styles, the black and the red and I have been wanting a pair of boots just like these for months now, they are such a twist on simple black boots and would match absolutely everything. Number 6 again, is such a classic piece, it would go with absolutely anything and you could pair it with black or white shoes, so no clashing! I have almost picked up number 12 a few times now, or similar styles, it's boxy, it's got the classic metal handle and it is black, perfect for any night out or day trip into town. Em Sheldon obviously made me want number 13, the black biker boots that seem to go with everything be it a floaty, girly, boho dress or a pair of jeans, they match everything! So what styles are you crazy about this spring? Is there anything on my wishlist you are lusting after too? Tell me in the comments below.